What Will Ichiro Mean to New York? On Monday, July 23, Ichiro Suzuki became a New York Yankee. The ten-time MLB All-Star and the ten-time Gold Glove winner, realizing he was probably too old to be a productive part of the struggling Mariners’ rebuilding process, requested a trade from the team that brought him to Seattle in 2001 and made him a worldwide mega-star. And the Yankees answered the call. In Seattle on Monday to begin a three-game series, the Yankees sent minor league pitchers D.J. Mitchell and Danny Farquhar to the Mariners in exchange for the 38-year-old outfielder. Once the trade was set and the press conference was finished, Ichiro simply removed his possessions from his two lockers – a luxury afforded Mariners’ veterans – and walked to the visitors’ clubhouse at Safeco Field. Ichiro spent the majority of his MLB career batting leadoff; that night Yankees manager Joe Girardi inserted him into the lineup in the 8 hole. After receiving a warm ovation from the crowd and offering a polite bow, Ichiro singled (of course) in his first at-bat as a Yankee and later stole second base. But Ichiro is a superstar who isn’t producing in superstar fashion this season. In fact, the two-time A.L. batting champion (.350 in 2001 and .372 in 2004) has watched his average drop over the course of the last few seasons, from .352 in 2009 to this season’s un-Ichiro-like .261 as of this writing. Still, the buzz surrounding the trade that made Ichiro a Yankee is significant. On Monday Twitter and Facebook blew up with messages about the surprising news. The majority of my Japanese friends were overjoyed by the deal – with the exception of one, a Yokohama native and die-hard Yankees fan who has despised Ichiro for years because of his selfish reputation. A number of my non-Japanese, baseball-loving friends thought this was a good move, as well. “Reenergize” was a word I saw often. “ . . . Could easily see being in a pennant race reenergizing him,” tweeted Ryan Ruocco, Stephen A. Smith’s partner on ESPN Radio and host of Yankees on Demand. Even Ichiro alluded to that during his press conference in Seattle: “I’m going from a team having the most losses to a team with the most wins. It’s hard to contain my excitement,” he said through a translator. Since the trade happened while the Yankees were on the road, I wondered what the atmosphere would be like at Yankee Stadium on Friday, when Ichiro donned the pinstripes for the first time after eleven-and-a-half years in a Mariners uniform. 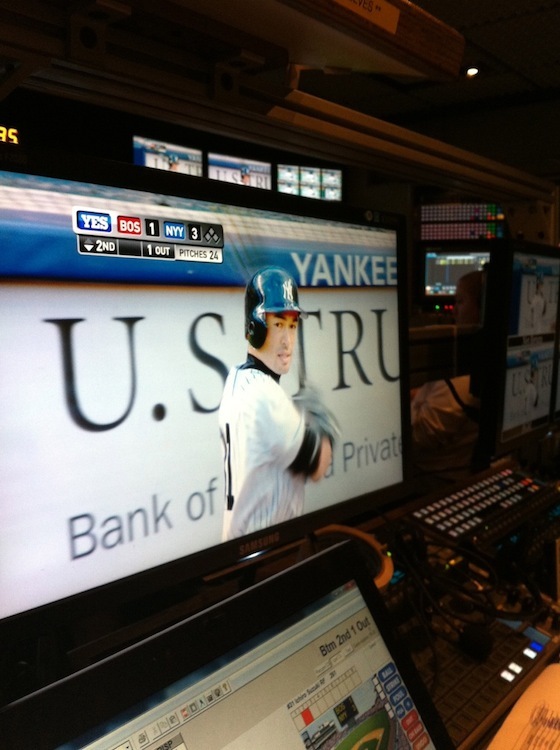 NHK, Japan’s national public broadcasting network, followed Hideki Matsui when the former Yomiuri Giant was an All-Star for the Yankees from 2003 until 2009. Naturally, I assumed I would see the NHK truck parked in the loading dock when arrived at the stadium for my job as a graphics operator for the YES Network. But I learned that the NHK crew is in London, working with the BBC and Olympic Broadcast Services to test a “Super Hi-Vision” 8K television system at the Olympics. NHK should be back in the Bronx in mid-August, when the Texas Rangers are in town. NHK hired a cameraman to record Matsui’s every move – in the field, at the plate, even spitting sunflower seeds in the dugout – during his seven seasons as a Yankee. Will they do the same for Ichiro? Obviously the YES Network doesn’t devote its resources to covering only one player, but the production team realizes it needs to pay special attention to this trade because it brought a high-profile star to New York. “[Coverage] is treated a little differently because you’re putting another Hall of Famer in the lineup, so yeah, you approach it a little differently,” says Bill Boland, senior producer at YES and the lead producer of the network’s Yankees telecasts. That means getting shots of the Bleacher Creatures chanting “I-chi-ro!” during their Roll Call and lingering on the ovation Ichiro received during his first at-bat, showing signs from fans welcoming him to his new baseball home. But what will Ichiro mean to New York? It’s a baseball thing that probably won’t last very long. Ichiro will be a free agent after the season, and I imagine the chances of the Yankees re-signing him for 2013 are pretty slim, especially if Brett Gardner is deemed healthy after elbow surgery. Perhaps Ichiro himself, in the twilight of his career, isn’t looking past 2012 and is content to contribute a few singles, stolen bases, and solid defense to a team that, unlike the Mariners, actually has a chance to go deep in the playoffs and even win the World Series. He won’t settle here and become part of the Japanese and Japanese American community in New York. We won’t see him at Japan Society film festivals or ramen contests or fundraisers for 3.11 relief. 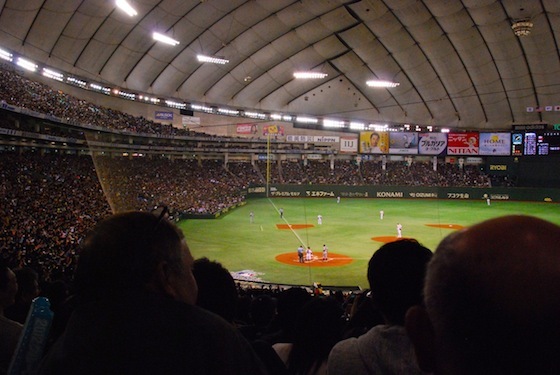 But Ichiro has amazing star power for the Japanese, which I witnessed in a packed Tokyo Dome when the Mariners and Athletics began this season in Japan. Now our community has a great Japanese player with Hall of Fame credentials playing every day in the city, even if only for a couple of months. And I think, whether or not his 38-year-old body has anything left to give, we’re excited about that. Previous Previous post: Are You Ready for Some Ramen?